The FVCOM-SWAVE domain is built by extending the Gulf of Maine FVCOM domain to cover the interior North Atlantic Ocean, including the Gulf of Mexico and further northern coastal regions. Two open boundaries are specified: 1) a cross the interior North Atlantic Ocean and 2) a cross the Labrador Sea. 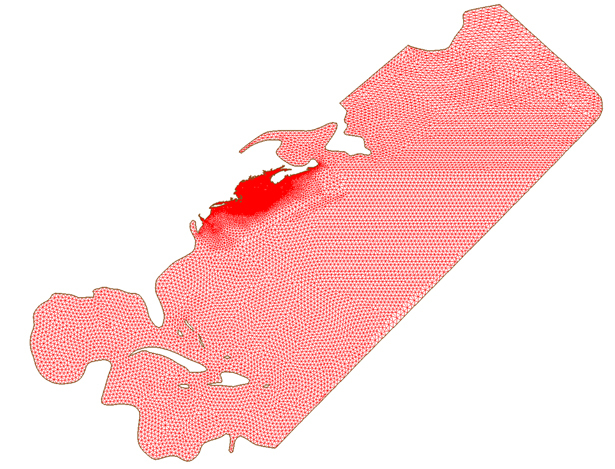 The horizontal resolution varies from 25-50 km in the interior to 0.3-0.5 km near the coast. 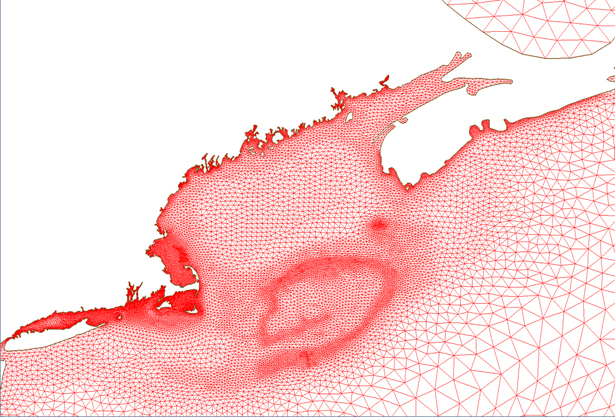 The grid in the Gulf of Maine and coastal region is enlarged in the figure below. The enlarged view of the UG-SWAN in the Gulf of Maine/Georges Bank and New England Shelf region. In this region, the model grid is the same as the 2nd generation of the GOM/GB FVCOM.